Weighty Matters: What The Heck is "Water Extract of Dried Raisins"? What The Heck is "Water Extract of Dried Raisins"? That's the question I had when I noticed author, editor, columnist, blogger and radio host Ann Douglas (is there anything you don't do Ann? 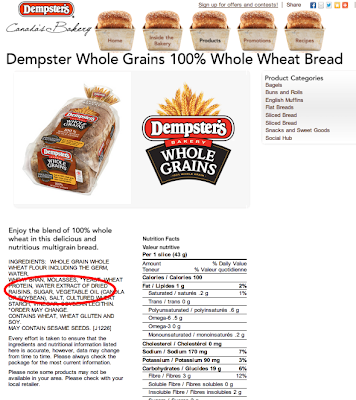 ), tweeting about the ingredients of a loaf of Dempster's Whole Grain Whole Wheat bread. My first thought was that it was perhaps the slimiest sugar synonym I'd ever heard, but then looking at the bread, sugar and molasses are both listed and there's only 2gm of sugar per slice. 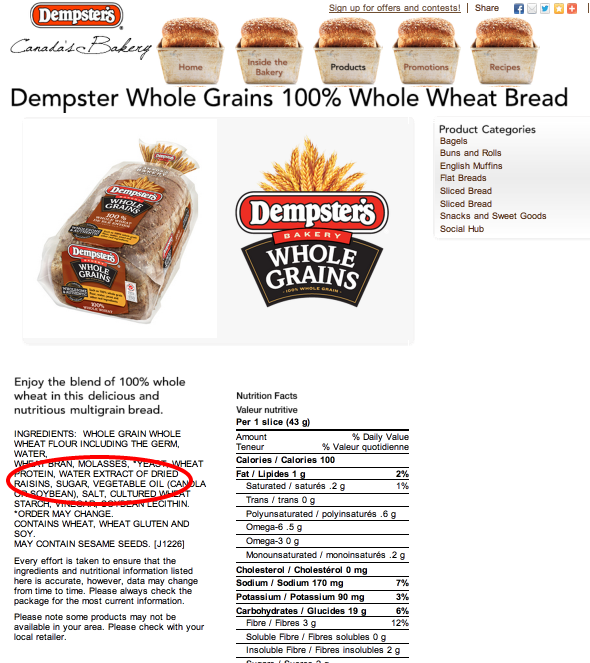 Next I called Dempster's and I was told that it's part of their move to include more "natural" ingredients, and that it replaced sodium stearoyl-2-lactylate, but when I looked that up I found it was an emulsifier and that didn't sound right. Digging around on the net I came up with the possibility that the raisin juice (as oxymoronic as that sounds) was there to provide tartaric acid and serve as a preservative of sorts. All that to say, just because you can pronounce something doesn't mean you know what it is, what it does, or whether or not it's good for you. While I don't think there's any risk to "water extract of dried raisins", there are plenty of fantastically easy to pronounce ingredients that I'd prefer my food not to have so don't fall into the natural fallacy laden trap of thinking that by definition if you can pronounce it, it must be good.